File under things that make you go hmm…. A detail missing from that narrative is the thief-takers of the 17th and 18th century… If your house was robbed and no one witnessed it, you were out of luck usually. Unless you hired a thief-taker who would then track down and retrieve your property (sometimes by negotiating with the actual thief), but would not always apprehend the culprit. It was even worse if the criminal was transient. Then many crimes went both investigated and unsolved. Also, many thief-takers were corrupt and working with the criminal underworld. The other common system was the hue and cry. Where, by law, every able bodied citizen was expected to aid in the apprehension of a criminal who had been witnessed committing a crime. Neither of those are good options these days. Sheriffs and constables go back a much longer way in history (and UK and France are not the only countries with histories that precede the USA), so i’m wondering why you dismiss the police functions and police powers of these non-soldier elements so out of hand. Surely an accurate analysis of this subject includes the history of the growth of the vindictive forces of the King’s Peace, including magistrates’ swords and jailing, dungeons, and lawcourts… all part of the current policing system. Only the name has changed, but the forms have evolved too. Within the space available, I think I’ve dealt with the differences between cops and constables above. It’s not that they lacked police powers; they just didn’t have the same ones that patrol cops were given. The turn to modern policing (in the Anglo-American context) represents a shift in tack by the state from the use of sheriffs and constables — and soldiers and dungeons, for that matter. The main point is that the old methods of repression weren’t working against the collective challenges posed by the emerging working classes. 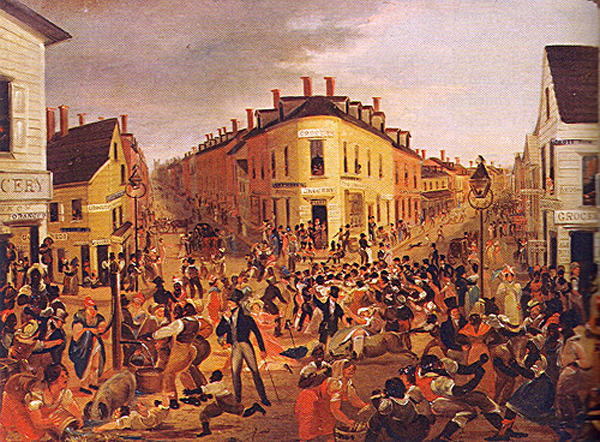 In 18th century England, for example, the state escalated punishments dramatically and also dealt ferociously with crowds in the decades leading up to Peterloo. The point was that those who controlled the state concluded in the first half of the 19th century that “more of the same” would not do against the new forms of collective defiance. Constables were not on constant patrol and didn’t have wide discretion to use force (even nonlethal force), and military force could turn a protest into the revolt. So the turn to large squads of patrolling officers, authorized to use nonlethal force under their own discretion, represents a significant shift in response to a change in the characteristics of the population to be policed. I didn’t take the time to go into it, but the invention of police went along with a shift in the theory and practice of punishment. To take England again, the rising harshness of sentencing in the 18th century included execution for more and more crimes, including property crimes. The regime was so widely hated that some juries started refusing to find people guilty simply because the sentences were so harsh. This made punishment uncertain, and, in the minds of ruling-class thinkers, the uncertainty of punishment undermined the law’s deterrent effect. Long-term imprisonment wasn’t even an option as a punishment, because penitentiaries hadn’t been built. People did not “do time”; detention was generally reserved for those who were awaiting trial. Under the new liberal theory of the 19th century, imprisonment could be calibrated to be proportionate to the crime, which would make punishment more legitimate and certain. The same reformers also held out the possibility that time in penitentiaries could be “corrective” of the inmates’ personal character rather than just punitive. The theory also said that the constant presence of cops (or bobbies) could also serve an instructive, corrective or “civilizing” function. I remember that some traces of this view persisted into the early 1960s, but I think that the social movements of that decade — including the urban revolts in response to police abuse, the police riot at the 1968 Democratic convention, the police/FBI murder campaign against the Panthers, etc. — put an end to such illusions. About the courts. Those also changed at the time of the creation of modern police — in ways that I alluded to in this article. Citizen prosecution got pushed aside with the rise of public prosecutors. Grand juries eventually lost their investigative function as police departments added detective squads in the 2nd half of the 19th century. Now, crime scenes are off-limits except to people who put people behind bars for a living (cops and prosecutors), but formerly, citizen grand jurors would inspect the scene themselves and talk to witnesses. The whole movement of the century was to shift power and discretion in criminal cases toward cops and prosecutors and away from judges, citizens, and grand juries — a trend that is even more pronounced now in the era of mandatory minimums and plea-bargained resolution of cases. I never like history and social arts but in my desire to understand what’s happening today I realize that my lack of historical knowledge hinders my understanding of today’s events. Pingback: Slave Patrols and Civil Servants: A History of Policing in Two Modes | CrimethInc. Reblogged this on वज्र अध्वन्. Pingback: Is Extra Police the Answer to Crime?